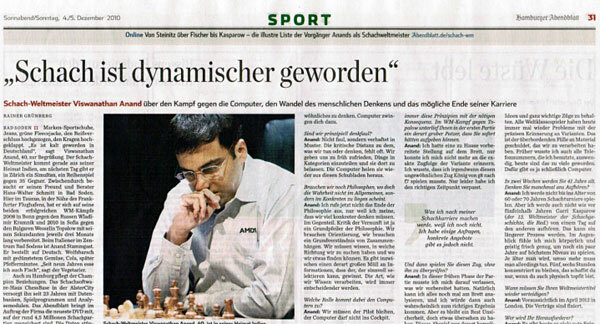 04.12.2010 – This morning we opened the biggest Hamburg newspaper to see a full page on Vishy Anand, talking about computers and how they have changed his and the world's approach to the game. Yes, and also about quitting chess at 41 (spoiler: he is not considering it). Yesterday the Telegraph had an interview with Magnus Carlsen. All because of the London Chess Classic that begins next Wednesday. Currently, Anand Viswanathan is preparing for the London Chess Classic, where he will take on Magnus Carlsen and Vladimir Kramnik. Sports reporter Rainer Grünberg [who is himself a former Bundesliga player] visited Anand in In his training camp in Bad Soden, Germany. Rainer was also acting as a courier for the Hamburg software house ChessBase. He brought with him a DVD with 4.5 million games [a pre-production version of Mega Database 2011]. These games can theoretically be downloaded on the Internet, "but to be on the safe side" Anand prefers to use ChessBase data. He belongs to the first generation that grew up with computers. On the use of a chessboard: Of course I have a chessboard. Some of the younger players say they don't, but that is pure propaganda. I always consider on a board whether I really like the positions that I want to play, if I really understand everything that I have analyzed with the computer. You see things better in three dimensions. But it is true that I use the board far less than I used to. I work mainly with the computer. How computers have changed chess: With today's databases everybody has a wealth of information available. Previously this only applied to a minority, players with the appropriate networks, for instance in the Soviet Union. This development has led to a democratic broadening of knowledge and the opportunity to access ideas far more quickly. This applies to most other areas of life as well. If we want to know something, we google it. Today, in order to become a good chess player, it is not so important whether you were born in Russia or Europe, you can do it anywhere in the world if you have the appropriate talent. In addition, chess playing computers have become so strong that you can analyze all phases of the game more extensively, deeper and more accurately. All these factors have changed the game. Chess has become more dynamic, piece play has become more effective. The ability to defend oneself in bad positions or against king attacks has increased dramatically. General principles are moving more and more into the background, calculating move sequences is more important. How they have changed his thinking: have become more critical in my decisions, and don't allow myself to be guided by a few general strategies. I look for special moves, for exceptions to the generally accepted principles. The exceptions of course have their own logic, but we have not been able to understand it so far. With growing understanding we are often confronted with moves whe would have previously rejected, out of general considerations. This is the merit of the computer – they point to many new and unusual ideas. People are afraid to think out of the ordinary, computer to force you to do so. But: we must be the pilot, the computer must not be allowed into the cockpit. Whether the 41-year-old thinks about quitting? I will not go on playing tournaments until the age of 60 or 70, but I will not suddenly stop playing, like Garry Kasparov did five years ago. It will be a longer process. Right now I feel physically and mentally fresh enough to compete at the highest level, at least for a couple of more years. Does he understand the decision of Magnus Carlsen to drop out of the current World Cup cycle? No, because unlike the past ten or fifteen years, this time almost all the key points are firmly in place. It's been a long time since had so much clarity in the fight for the World Championship.